Shockwave Therapy (ESWT) is a leading force in the improvement of skin tightening, cellulite, and stretch marks. 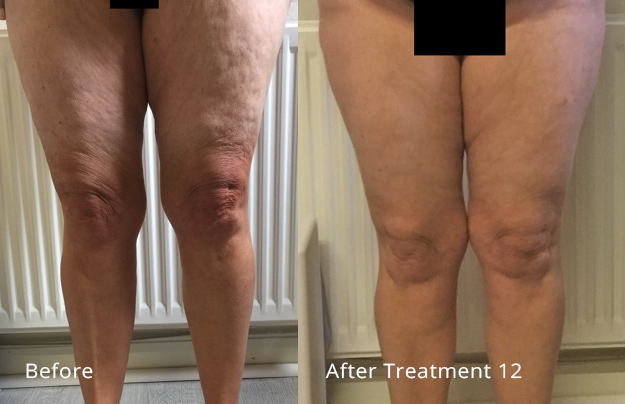 3D-shockwave can be used as a standalone application or in conjunction with SKEYNDOR Lighter Legs, Destock and Mesoslim treatments to accelerate results. As a standalone application the focus is generally on improving the skin structure and connective tissue. Typical treatment areas are cellulite, connective tissue weakness (upper arm, under abdomen etc) and stretch marks. Cellulite – Shockwave Therapy works by stimulating fat breakdown, collagen synthesis and lymphatic drainage via the delivery of radial shockwaves. This is the latest technology clinically proven to reduce the appearance of cellulite and increase skin elasticity. The high energy radial shockwaves squeeze the surrounding tissue and breaks down the grid structure of the molecules. The tensile wave leads to a collapse of the gas bubbles within the fat structures (Cavitation) which re-expand after the high energy radial shockwaves and thus ensure destabilisation of the fat structures. There has been much research carried out that highlights the fact shockwave therapy will accelerate the results of other fat removal, skin tightening and cellulite treatments. Not only are the results improved by nearly double but also they are also seen much quicker. We recommend combining these treatments with Skeyndor to achieve your desired result. Clients would need to have a Full Body Analysis Consultation with a Therapist and we will then tailor a course to your needs. We would combine treatments with Skeyndor and the Pressotherapy machine for better results. The client is always put on the Pressotherapy machine after 3D Shockwave to drain the lymphatic which is vital after each treatment.